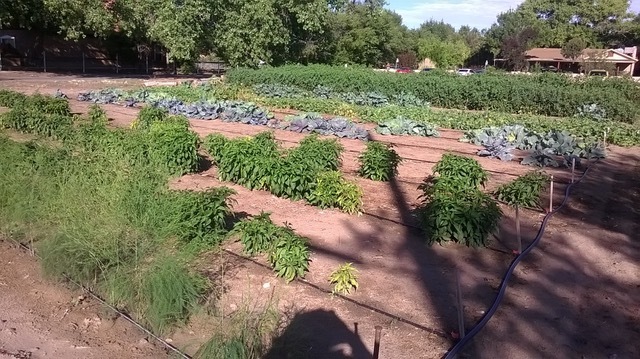 The CFP Community Garden is a donation vegetable garden in the heart of Corrales. Started by Cindy Harper and beginning as a place for the patients of Dr. Alyson Thal to enjoy the many aspects of being outside and socializing, it grew into a mature production garden supplying over 2600 lbs of vegetable to St. Felix Pantry and a few hundred pounds of food to the Corrales Senior Center in 2017. In 2017 the garden expanded to include a small orchard beginning with three fruit trees. It will eventually have about 20 fruit trees, and additional berry plants around the perimeter. Volunteers will participate in planting and harvesting throughout the spring and summer. In the fall volunteers will help with clean-up and possibly additional planting. The project is currently open to SCMG volunteers and patients of Dr. Thal. Typically volunteers meet on Tuesday and Thursday mornings at 7:30 for about an hour, depending on the work load. In the summer this may also include Saturday mornings. You will be notified by email of specific days and times.